Indonesia AirAsia has decided to significantly slow down expansion in 2014 as market conditions in the Indonesian market, particularly domestically, have become challenging. The carrier, which added eight A320s in 2013, had dropped plans to add two aircraft in 1H2014 and is also considering deferring some or all of the four deliveries initially slated for 2H2014. Indonesia AirAsia is also planning to adjust its network to focus more on international services. The international market is more profitable as it is less impacted by the devaluation of the Indonesian rupiah. But cutting domestic capacity will result in a reduction in AirAsia’s already small share of Indonesia’s domestic market. AirAsia still has a strong position and bright outlook in Indonesia’s international market. But 2014 will mark another setback in the group’s long-term strategy of securing a larger presence in Southeast Asia’s largest domestic market. This is a second in a series of analysis reports on the Indonesian LCC sector. The first report analysed the capacity cuts and reduction in aircraft utilisation levels at Tigerair Mandala. Indonesia AirAsia (IAA) is not planning to follow Tigerair Mandala in reducing capacity or aircraft utilisation levels. But the carrier is delaying fleet expansion and plans to make network adjustments which will result in some capacity being allocated from the domestic to international market. IAA currently operates a fleet of 30 A320s. It added eight A320s in 2013, driving 36% growth in seats and 33% growth in ASKs. The carrier transported 7.9 million passengers in 2013, representing 34% growth over 2012. IAA financial results for 2013 will be disclosed when Malaysia-listed AirAsia Berhad, which owns a 49% stake in IAA, reports fourth quarter and full-year results at the end of Feb-2014. Mr Ridzki says the carrier is now reviewing whether to proceed with the four deliveries slated for 2H2014. He says IAA is closely monitoring market conditions and is particularly observing the USD-IDR exchange rate and national elections, which will take place in Apr-2014 (parliamentary) and Jul-2014 (presidential). If market conditions do not improve within the next few months, IAA could end up keeping its fleet at the current level of 30 aircraft until 2015. The rupiah devalued by 26% in 2013, with most of the devaluation occurring in August and September. As a majority of airline costs are fixed in USD, the sudden reduction had a huge impact on profitability for all Indonesian carriers, particularly in the domestic market, where all revenues are collected in IDR and it is difficult to implement fare increases. International sectors are less impacted, particularly sectors with strong point of sales from outside Indonesia. IAA is now planning to rebalance its network to focus more on the international market. 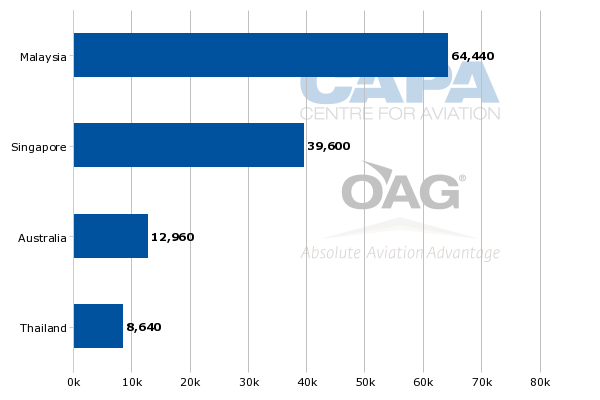 IAA is already the largest Indonesian carrier in the international market and currently allocates 58% of its seats to international routes, according to CAPA and OAG data. 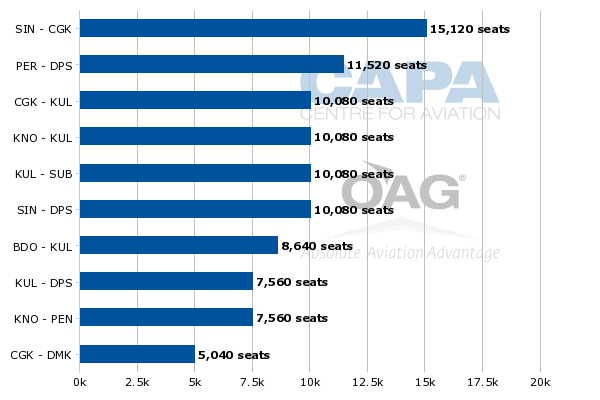 Mr Ridzki says IAA is aiming to increase in 2014 its international seat allocation to 70%. More international flights will offset an anticipated reduction in domestic flights as IAA cuts or reduces capacity on domestic routes which have become unprofitable as a result of the rupiah devaluation. IAA is adamant it will not sacrifice aircraft utilisation rates, which will be maintained in 2014 at the current level of about 13 hours per day. High aircraft utilisation is a key component of the AirAsia model, enabling the group to have some of the lowest unit costs globally. Mr Ridzki says the focus in 2014 will be on adding more capacity in its strongest international markets. IAA had been looking at potential new international markets and CAPA previously reported the carrier was aiming to launch services to India and Greater China in 2014. But such routes are not currently on IAA’s radar. IAA currently serves four countries – Australia, Malaysia, Singapore and Thailand. Malaysia accounts for about 51% of the carrier’s current international capacity while Singapore is also a very important market, accounting for about 32%. Australia accounts for about 10% and Thailand the remaining 7%, according to CAPA and OAG data. Malaysia and Singapore are both attractive in the current environment as Indonesia point of sale accounts for only about half of tickets sales in these two markets, providing a significant non-rupiah revenue stream. But both markets are very competitive and have seen total capacity increase by more than 40% over the past year. IAA at least for now is focusing more on growing in the Indonesia-Malaysia market, where AirAsia has a stronger position. 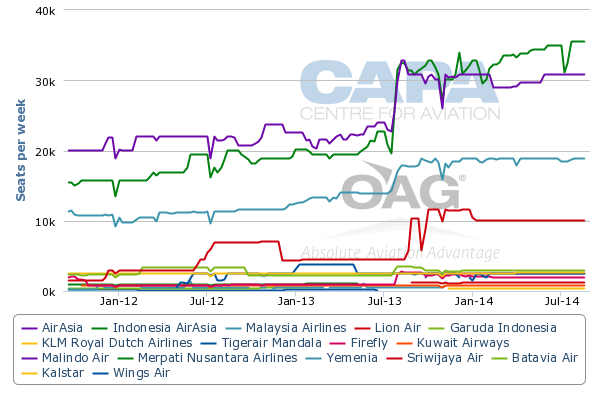 IAA is the only AirAsia carrier in the Indonesia-Singapore market and currently accounts for a 16% share of total seat capacity, according to CAPA and OAG data. IAA has a 31% share of seat capacity in the Indonesia-Malaysia market while sister carrier Malaysia AirAsia (MAA) has a 28% share, giving the AirAsia Group a powerful 59% share. IAA has grown its Malaysia capacity by about 66% over the past year while its Singapore capacity has grown by about 16%. Indonesia-Thailand is currently a more challenging market as it relies almost entirely on Indonesia point of sale. The recent political instability in Bangkok also has impacted demand. IAA currently operates 21 weekly flights to Bangkok (from three Indonesian destinations) and three weekly flights to Phuket. IAA has a 26% share of capacity in the Indonesia-Thailand market. Sister carrier Thai AirAsia (TAA) has an 8% share, giving the AirAsia Group a 34% share. While IAA is unlikely to increase its Thailand capacity in the near term, the carrier could look to add flights later in the year if the situation in Bangkok becomes more stable. Indonesia-Thailand is generally an under-served market with considerable growth potential. The Indonesia-Australia market is attractive, particularly Bali-Australia routes, as it is heavily tilted towards inbound traffic. While the Australian dollar also has devalued over the past year, the devaluation of the rupiah has been sharper. Bali-Perth is IAA’s second largest international route after Jakarta-Singapore and is currently served with 32 weekly return flights, according to OAG data. IAA also operates four weekly flights from Bali to Darwin. It does not serve Australia from Jakarta, which would not be as attractive in the current environment as it would be more of an outbound Indonesia market. IAA is looking at adding new destinations in Australia in 2014. Australia’s other major cities – Adelaide, Brisbane, Melbourne and Sydney – are not within IAA’s four hour range and are being left for new sister carrier Indonesia AirAsia X (IAAX), which plans to launch services by the end of 2014. Smaller Australian cities such as Cairns and Broome would potentially be within range from Bali. The Bali market overall will likely see significant growth from AirAsia in 2014. As Bali will be the base for IAAX, there is a need for IAA to also build up its Bali operation as the AirAsia X model relies heavily on short-haul feed. With Bali being almost entirely an inbound market there is even more attraction as IAA is keen to reduce its reliance on the weak rupiah. IAA currently serves five domestic and five international routes from Bali, where the carrier has about a 16% share of both domestic and international capacity. The carrier recently moved one A320 from Makassar to Bali, an indication of its increased focus on the Bali market. The shift came as IAA dropped its Makassar base. The carrier dropped Makassar-Singapore and Makassar-Kuala Lumpur at the beginning of Dec-2013 and discontinued Makassar-Jakarta at the beginning of Feb-2014. IAA now only serves Makassar from its bases in Bali and Surabaya, according to OAG data. While Makassar-Jakarta has been the only route cut so far in 2014, several domestic routes will likely be suspended or reduced as IAA increases its focus on the more profitable international market. The decreased focus on the domestic market, however, will come at the expense of AirAsia’s strategy of establishing a more significant presence in the Indonesian domestic market. IAA has been focusing more on the domestic market over the past two years, roughly doubling its domestic capacity since early 2012. The expansion was intended to be just the first phase in a broader plan by the AirAsia Group, which sees its position in Southeast Asia’s largest domestic market as one of its largest weaknesses. Indonesia is the world’s fifth largest domestic market and AirAsia’s failure to secure a meaningful share is a serious weakness in the group’s otherwise very strong position across ASEAN that group CEO and founder Tony Fernandes has been keen to address for some time. IAA currently has a 4% to 5% share of Indonesia’s domestic market. The carrier now risks seeing its share slip back closer to 3%, which is what it achieved in 2012. While AirAsia may have to again defer or even abandon its ambitions for a larger slice of the Indonesian domestic market, the increased focus on the international market is the right strategy for IAA. The carrier needs to cement its leading position in the international market as other LCCs, particularly Lion and Citilink, start to focus more on international expansion. Financially the international market is also critical for IAA as it has always performed better than the domestic market with the gap between the two widening as a result of the rupiah devaluation. With IAA preparing for initial public offering (IPO) the carrier cannot afford to retain unprofitable routes for the sake of domestic market share. AirAsia will be keen to relook at domestic expansion in Indonesia once market conditions improve but the reality is it will never be able to have the scale of domestic market leaders Lion and Garuda/Citilink. There are huge opportunities for expansion in Indonesia’s international market, where AirAsia has succeeded at building up a meaningful and profitable presence. The upcoming launch of IAAX and adjustments at IAA will further improve the outlook for AirAsia in an important and fast-growing international market. Citilink’s plans and outlook for 2014, including expansion into the international market, will be analysed in the third part in this series of reports on the Indonesian LCC market.